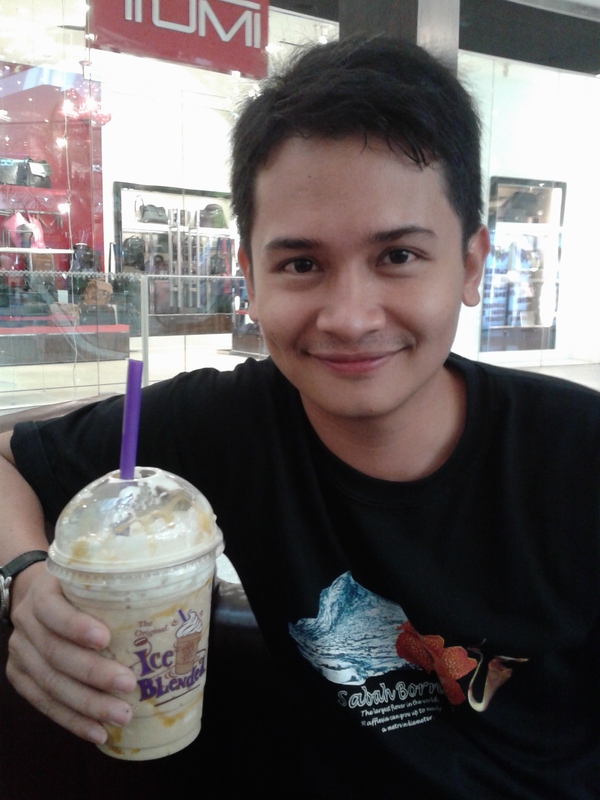 The 29th B’Day (Episode I) : Alhamdulillah – Writing My Own Stars. The clock struck midnight and I am officially a 29 years old! YES, another year to enter the 3 series. How does it feel? I have to say it is a kind of a revelation that are both exciting and intimidating. Exciting for what life has for me ahead; intimidating for the fact that time can never rewind and cannot be undone. So what do I have up on my sleeves for this 29th birthday? End of May 2013. Happy 29th Birthday, Childlike! Or is that nickname is still relevant? Maybe I should just stick with Undomiel. Hahhaa! Well, I have to say that I was a bit disappointed to learn that a plan that was concocted nearly 2 weeks ago in conjunction for my birthday cannot be materialized due to eleventh hour setbacks. Someone was asked to replace someone else in the professional line. I know I have to understand that it is career; so you can’t tolerate with that; BUT I just can’t help but feeling frustrated. I mean, I am being sentimental. BUT, I am proud to say that I handled that with grace and poise. I controlled the anger and just psyche myself with Plan B. 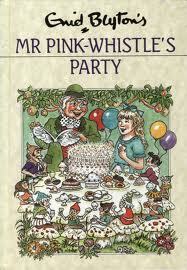 Nonetheless, I realized that the guilt in the other party was eminent. Although the body was tired of handling all those gadgets and managing people and all (usually around 11 p.m, no SMS or calls as already dozed off), but still the effort of waiting up until 12 a.m. just to wish “Happy Birthday” (which is not the usual self! “Romantic”??? In 4 years? Hmmm… LOL! Hahahhaha!) and giving words is just nice. I am touched. Thanks. I feel truly blessed. Who am I to receive such wonderful soul? I am temperamental; I am intense; I have so much flaws. But, among all the glistening glasses, there is one diamond in the rough that shines sincerely, emanating my life from those darker days; for 4 years now. I have nothing much to say except Alhamdulillah. All I can say, I am very much married now. Thank you so much. 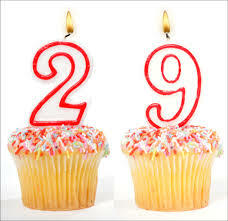 I am officially 29 years old! Another year for 3 series. Amin. Hopefully, I will age gracefully with dignity and wise. 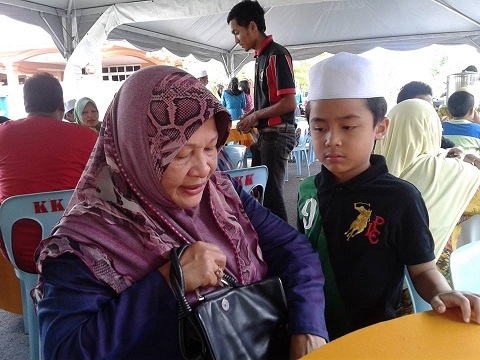 On whole, what I want for my birthday is that I wish that I will become a better Muslim; a better teacher; a better child to the parents; a better confidante to The Halo; a better friend; a better Malaysian – in short, a better human. I hope that as my age adds up, so will my knowledge and my personality. 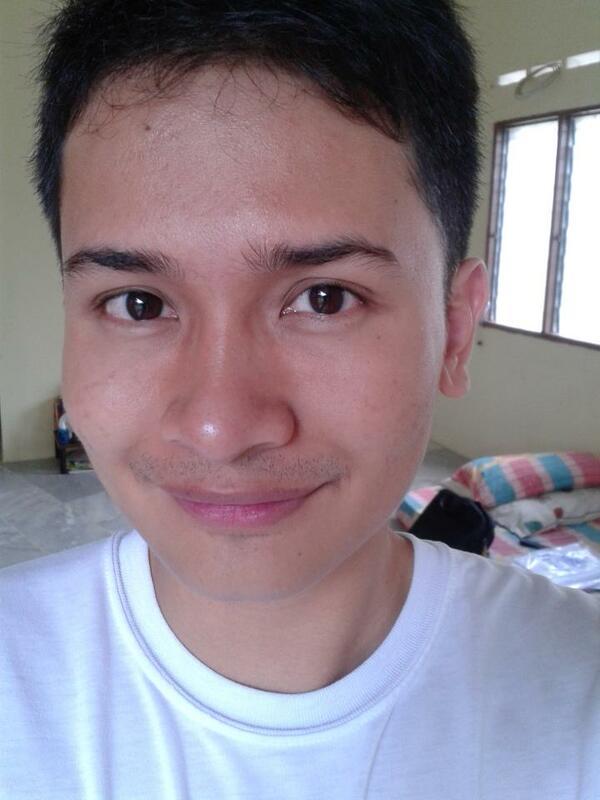 I hope I can become a positive-minded person and never become too drifted with emotions. I also hope that a dream will be materialized if possible by the end of this year (Insya ALLAH. Who knows?). Oprah Winfrey. One of the three inspirations of my life. I concur to what she said. I have come to a point where I am comfortable with myself that I embrace all my weaknesses and flaws. I have discover who I really am; and where I see my life in the coming years. I have become so clear about who I am and I have decided, am deciding and will be deciding what is best for me. Nobody interferes that. I write my own stars. Insya ALLAH. 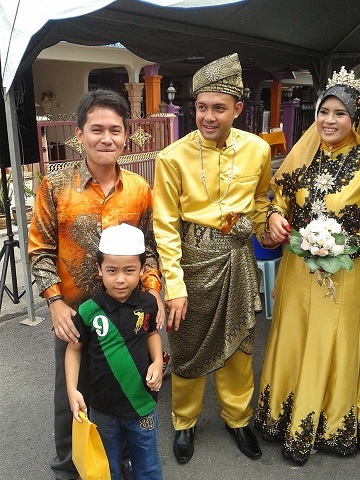 Firdaus Sulhi’s Wedding @ Anak Bukit, The Kedah Royal Town & A Happy Tadao Kaamatan 2013! Like I’ve said before, weddings are not my cup of teas but yeah, I do make efforts to force myself to attend the weddings of good friends or best friends or friends who I feel had exhibited such great remarks in my life that I will be in most guilt if I just pay no heed. 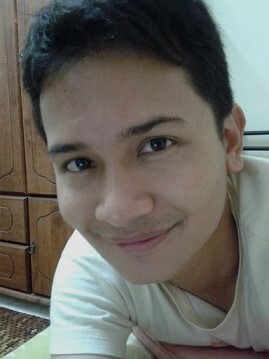 OK, cut the craps – so after Khai & Muzem, it is time for Firdaus Sulhi or affectionately known as “Firdak”. Hahahaa. Pidos and his wife. God bless, congratulations! Rifqi on the other hand was giving his poker face for being so sleepy. Mak was busy tending Rifqi who still couldn’t get away from his sleepy mode. 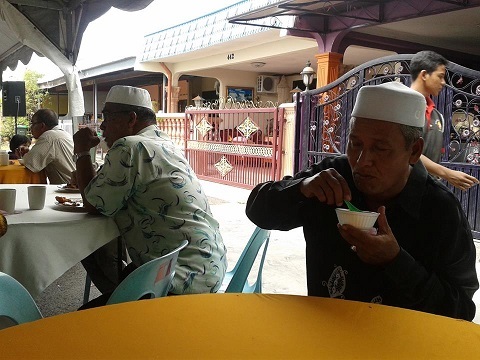 Ayah savouring the “bubur kacang” (nut gravy?). He said it was delicious! 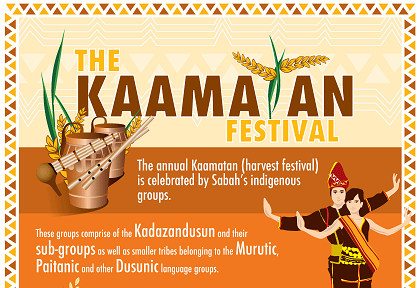 Firdak’s place is in Taman Aman, Anak Bukit which happens to be the Royal Town of Kedah. It was just beside the main road and is situated between the Sultan Abdul Halim Airport and also the Kedah State Palace. So happened that the couple’s theme was YELLOW; so royal! 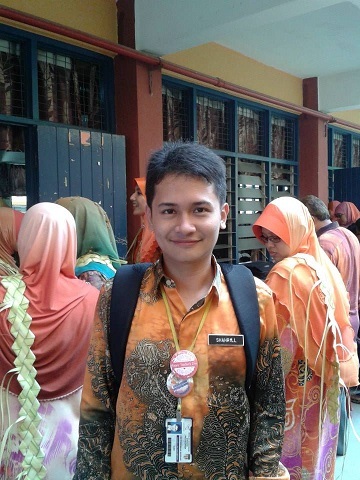 ; AND my ‘batik’ was orange-ish (from the Teacher’s Day)! Hahhaaa, coincidentally suits the mood, same like what happened in Muzem’s. On whole, it was a brief affair but satisfactory. 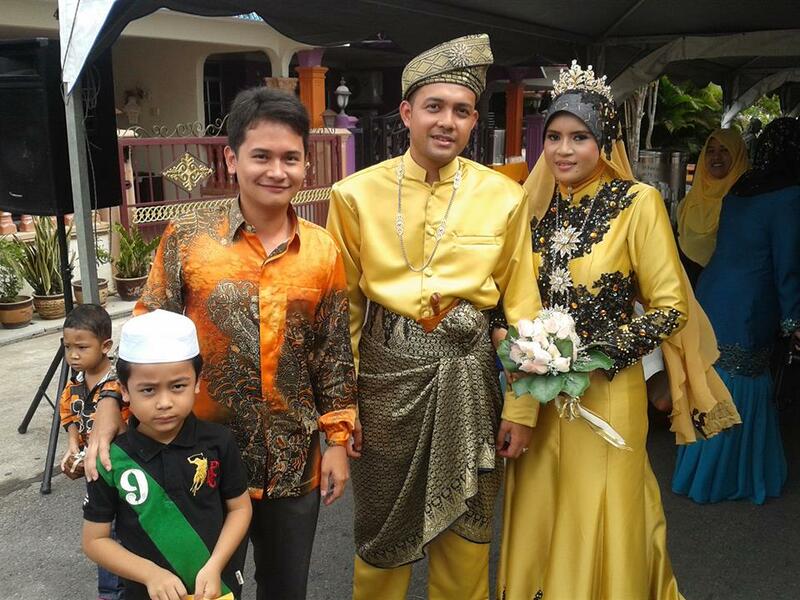 Congratulations to Pidos/Firdak/Firdaus Sulhi and his wife! Oops! Not ready to give that “photogenic” shot just yet! LOL! Melinda Louis from Telupid, winner of Unduk Ngadau 2012 – A Kadazandusun beauty contest in conjunction to “Kaamatan” festival. Yes, my blog is the solace when human beings are too complex and too difficult to understand. When I write, I free the emotions in poetry writing; evacuating the dusts and debris of meaningless, behind. I admit that I could be dramatic and intense; and I have done dramatic and intense things, and I am doing dramatic and intense thing now -which Goodness knows where it could have been leading towards to. Good Lord, could it be The End? If that’s the case, seems like the bond sealed wasn’t that strong as I thought it would be. God forbid, but I am prepared for whatever come-what-may. Angelina Jolie – for her bravery and humanitarian side. Yes, she is beautiful Hollywood beauty, but what she gives back are what really intriguing. She is also tough in sense of she battled her darker pasts with her “experimental days” & I felt strongly related to that. Oprah Winfrey – for her courage and defying the odds. Being raped by a family member at the young age and then bounced back to become one of the most influential women in the world (she’s the backbone of President Obama’s winning in 2008). She also transpired a lot of good quotations and motto that are really inspiring – especially the relationship between her and The Amazing Grace a.k.a. God. Professor Dr. Muhaya – A Malaysian optical surgeon who combines her scientific persona with Islamic approach in motivational quotes and talks. I like her subtle personal and quotes. 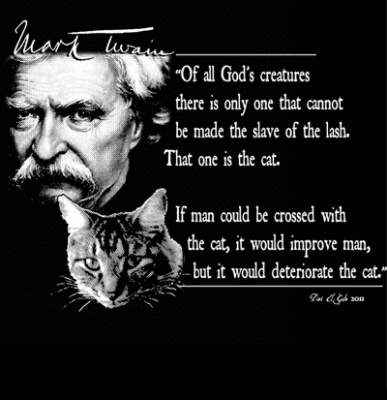 There are some of the quotes that I feel relate to. Her quotes do sometimes give me “slap-to-the-face” moment or self-reflections. Anyway, I am about to write about my No.1 inspiration, Angelina Jolie or affectionately known as Angie by her fans (including Yours Truly). I feel so dwarved whenever I think about what she has overcome and comparing to my relentless lamentations over trivial matters. You know, life is short and you should cherish that and appreciate those who are around you; instead of being too cooped in the darkness of melancholy. You have to have a grip of yourself. You have to be brave and bold to face the world; and make the most of the beautiful life ahead. 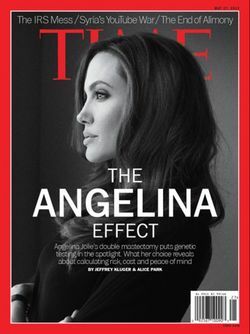 On 14th May 2013, Angie has shocked the world when she revealed that she had undergone double mastectomy (remove the breasts) surgeries in order to kill the 87% risk of developing breast cancer due to defective gene called BRCA1 gene. By underwent the surgeries, she had reduced it to 5%. It was all uprooting the family tree; her mother Marcheline Bertrand died from ovarian cancer and did develop breast cancer as well; while her grandmother had ovarian cancer. Featured in Time Magazine cover for May 2013 edition. What I am gauging from all these hullabaloos is that life is short. We have to be brave to make options and decision; and we never must let anything eclipsed our lives. We have to be gallant to fight and defy challenges or melancholy in life. 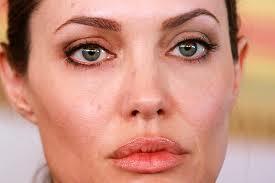 Angie is a beautiful and brave role model and she inspires me to become bolder and braver in life. You never know, when is your turn. Calamities and setbacks are like tigers at night, crawling silently to attack you. With that spirit, I want to be able to rejoice and get out from this dark phase. Yes, I may not know where it would lead me; but life is short and I want to cherish it before I die. She is inspiring. Life is short to be cocooned in sadness and melancholy. Cherish the ones you love; give back to the people and society or anyone who needs; be bold and brave. That are things that you need to live a good life. I live the life I want. Angie once quoted : “Be Brave, Be Bold, Be Free.” Thank you, Angie! 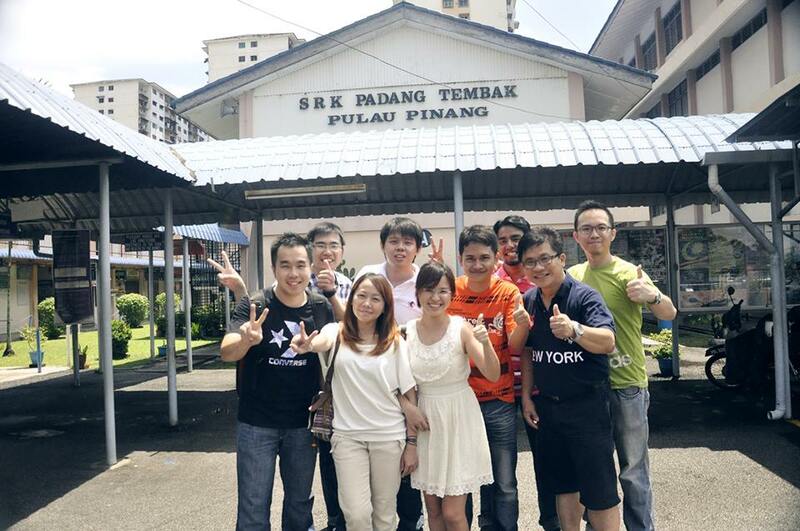 Class of 1996 @ SRK Padang Tembak, Penang Island : Friendships, Yonder Makes The Hearts Fonder! Friendship transcends time, skin colours and religions. That is the message I hold dear to my heart and as well as inspired to nurture within my pupils. Honestly, I had a great childhood. Growing up in Padang Tembak, Penang where predominantly occupied by the Chinese, my primary school life was all sweet. Although there are differences in races and religions, we never see that; instead we became the best of friends and shared so many sweet and sour episodes together. I can vouch that the essence of “1 Malaysia” was where all of us transpired; and I have to say that I was lucky to be able to experience such friendships; rather than the younger generation these days (especially my pupils) who mostly never interacted with other races and presumably hold prejudices towards other ethnics – which I STRONGLY try very hard to eliminate in my classes! Our first attempt. Hahhahaha! – Picture credit to Lip Yong! 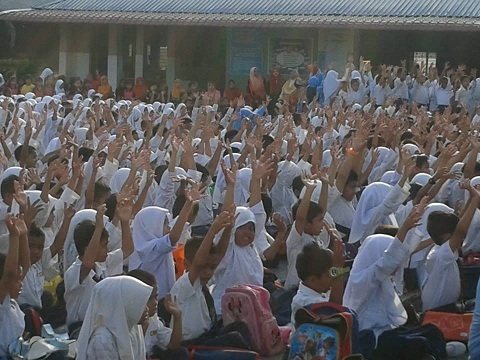 The Primary School. My first alma mater; the world when I learn to discover knowledge outside from cocoon. – Picture credit to Lip Yong! Anyway, everything thanks to Facebook! 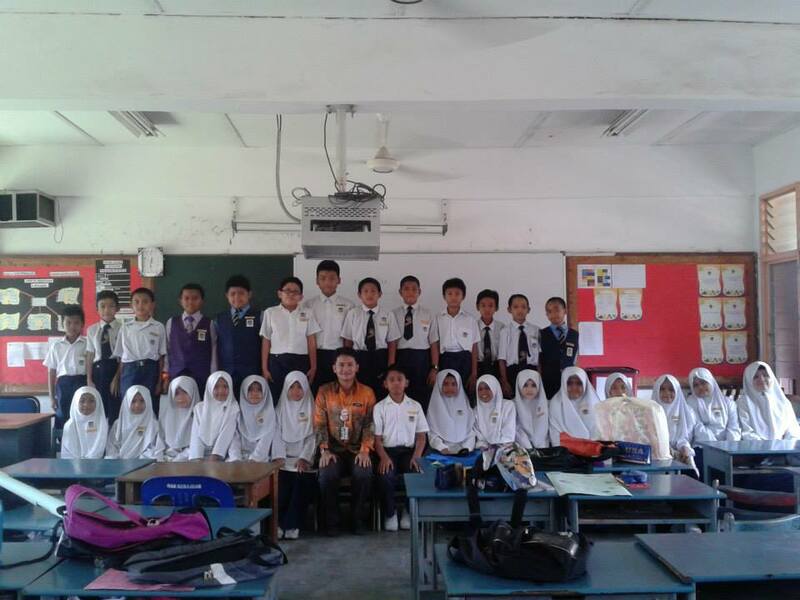 I was touched seeing my friend, Azizul (Zul) updated his status, recalling his good old secondary school experience with other Chinese friends; and that prompted me to write my status – how I missed my Chinese & Indian friends and how I missed playing “Power Rangers”, football, and all. 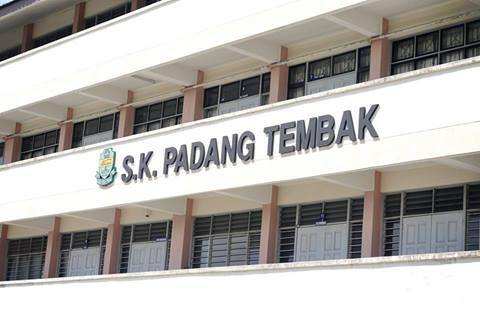 AND ALL OF A SUDDEN, the status became a hub for all of my childhood friends and former primary school expressing their “memory lane” memories and nostalgia in SRK Padang Tembak! Hahahha, talk about the power of tagging names! Hhahahaa! All of us got so excited that we recalled all those childish nicknames that we had for each other; untold crushes (hahaha! ); favourite past time, etc!!! It was such a great feeling to be able to reconnect with people who you knew at the early stages of your life! And I even rekindled with a friend who I had so called severe friendship due to differences in political matter (of which I have since grow to be able to agree to disagree – NEVER LET TRIVIAL MATTER SUCH AS THAT RUIN WHAT YOU HAVE BUILT FOR YEARS!!). I am just glad that I wrote that status. Picture credit to Lip Yong! Angeline & Farah had the “girls bonding” time. Hahhahaa….. (,”) – Picture credit to Lip Yong! I was cooking up some stories? 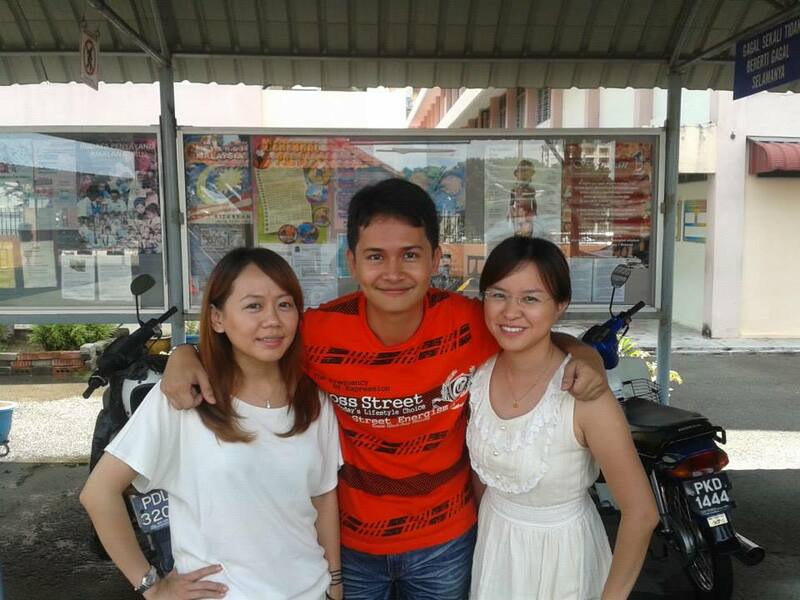 I couldn’t remember what I talked to Choo Mei & Angeline with Kok Hin stupefied in between. LOL!- Picture credit to Lip Yong! Angeline, Chooi Me & I. A picture that caused some remarks by a senior colleague in SK Serendah. Oh, well. I can’t satisfy everyone. She has since been “dismissed” from my Facebook. Oops, sorry. (,”) Just because of a picture, suddenly my Islamic innocence is diminished into a hedonistic promiscuous??? 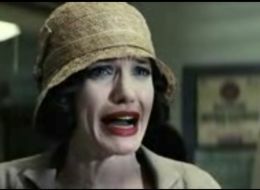 I was so appalled by the impression of accusation! 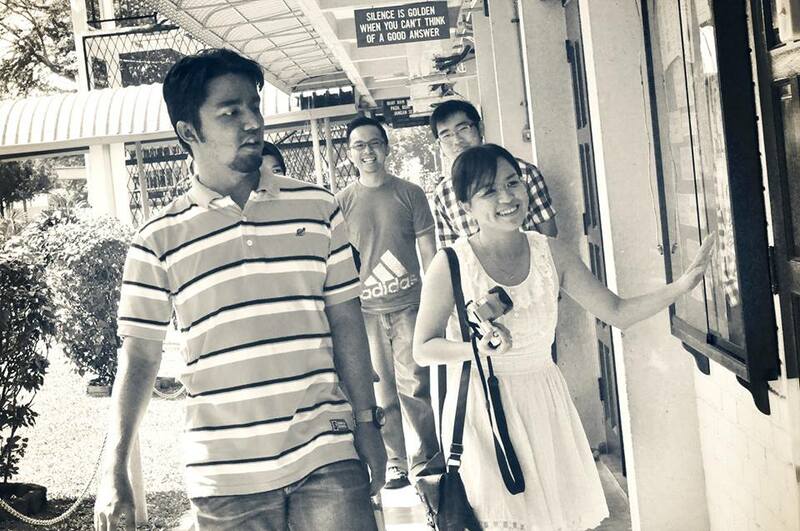 Zul, Angeline, Kok Hin, Shyi Wei & Farah in Retro style. – Picture credit to Lip Yong! So, on Friday, 17th May 2013; right after school, I pushed off to North from Serendah. Initially, I thought of staying in Tune Hotel in Penang like what I did at the end of 2012 but I scrapped the idea. I thought of Mak Ngah Nah in Lahar Kepar, Kepala Batas who happened to be my closest aunt. It has been ages since I last spent night at her house (that was like during primary school???!) and I thought of taking this opportunity to just bond with her and my cousin, Kak Aida. Taking my sweet time driving, I arrived at Lahar Kepar, Kepala Batas around 6.00 p.m. and was welcomed graciously by Mak Ngah Nah & Kak Aida. Picture credit to Lip Yong. It was nice to have chit-chat with them and after Maghrib prayer, Mak Ngah Nah recalled those yesteryear hardship stories living as a girl who was transferred from one house to another and experienced brutality of a stepmother. My eyes watered and had goosebumps when I heard the stories. Melancholic. But everything changed when she married the late Pak Ngah Shaari. His kindness make her world a new peaceful life; and that was why she never remarry although there were a lot of suitors after the death of Pak Ngah Shaari (more than 15 years ago) because Mak Ngah Nah is undeniably a beautiful lady. That really make my heart touched and overwhelmed. Subhanallah. Goofing around with Farah’s son?! – Picture credit to Lip Yong! Why we put out the “BEST” sign (thumbs up)?? 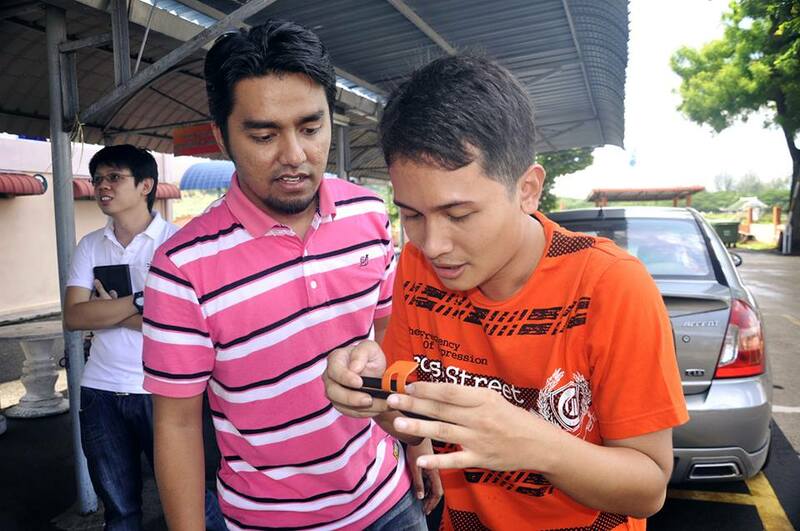 Hhahaa… seems like a promo from Bank Rakyat “Saya Mesti Pilih!”. (,”) – Picture credit to Lip Yong! The initial luncheon tentative at E-Gate was scrapped; instead we decided just to hang around at a Mamak Stall/Restaurant “Salam” at the Ayer Itam-Padang Tembak junction just like the typical Penangite style. Hhahaa! Well, this was actually rather a new stall for me because during my years as resident of Penang, this was not built yet; but well, time passes by! We had so many things to catch up and you could imagine that it was sunny when we entered the Restaurant and then it was raining; and then it was sunny again!!! Hahhahaa! All in all, it was around 2 hours we spent there! Choo Mei joined us at the very last hour from her working place. Playing “Power Rangers”, “Pepsi Cola”, football, “Pole-to-Pole”….ah…reminiscence, my friends! I love y’all. I just love this picture. We were trying to levitate. Hahaha! Thanks to the Mak Guard. Hhahaaa. We heart SRK Padang Tembak, Penang Island. Sincerely from Class of 1996! – Picture credit to Lip Yong! 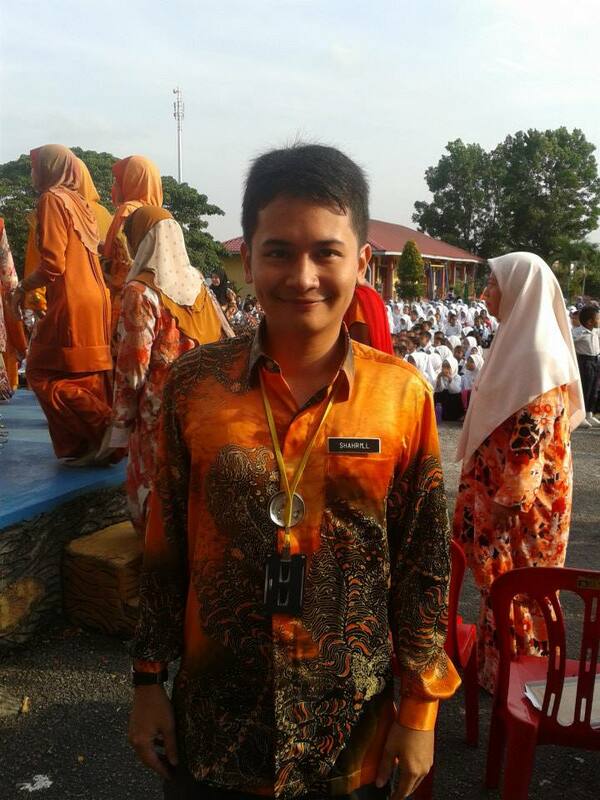 A Fiery Candle In The Wind : My 4th Teachers’ Day 2013 @ SK Serendah, Hulu Selangor. People say that God works in a mysterious way. You never know the rhymes or reasons for the magical moments. You know, I am truly blessed that I enjoy my career. As a teacher, I enjoy imparting knowledge to pupils and to nurture the growing buds into blossoming flowers. This year marks my 4th year as a teacher. 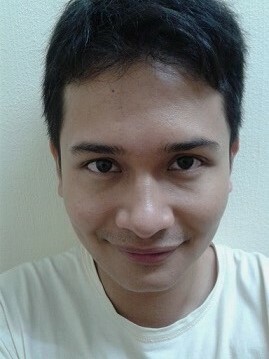 To recall the path that God has destined me when I was quitting my job as Assistant Relationship Manager in Affin Islamic; the slithering path to be interviewed for KPLI (teaching course) and NEARLY NOT GETTING THE OPPORTUNITY (refer to this entry : https://undomiel84.wordpress.com/2008/12/24/from-banker-to-teacher-against-the-odds-hallelujah-to-the-lord-swt-alhamdulillah/); and to be able to savour this career for 4 years now; I say – Alhamdulillah! 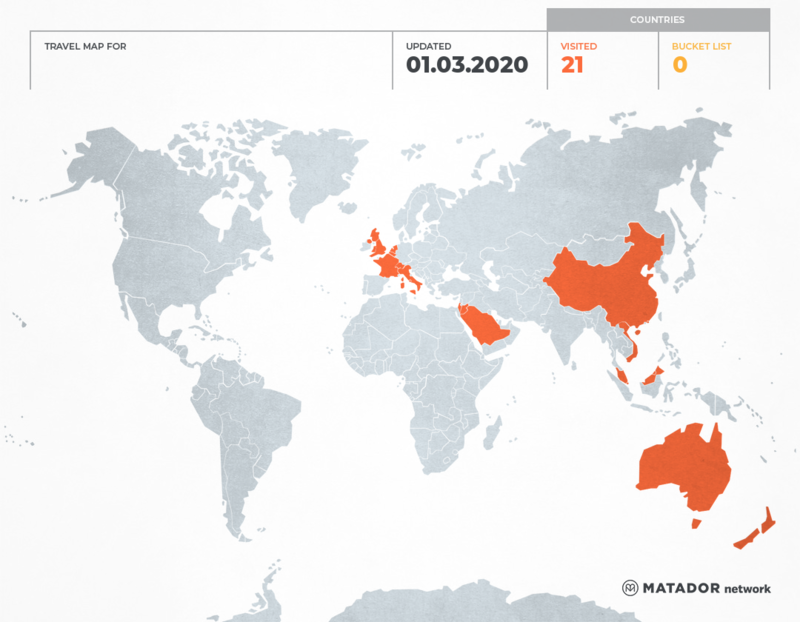 This year, the theme is Orange! Fresh from “Kedai Jahit Singapora” in Jitra. I like the tailor. He made wonderful “Batik”. 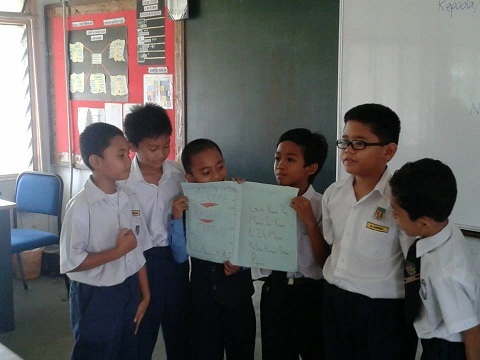 “Masam-Masam Manis” – the Cikgu Shaari sleeps in the class segment. 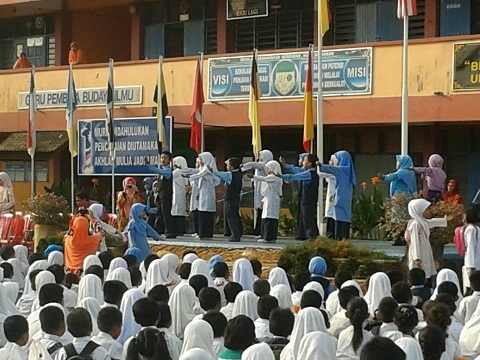 The performance by The Tahap 1 pupils; mimicking the song called “Guruku Tersayang”. Such a beautiful and touching lyrics contained in the song! So, we practiced until 3.00 o’clock (whereas other teachers have already gone back!). It was so hot that I felt sleepy. 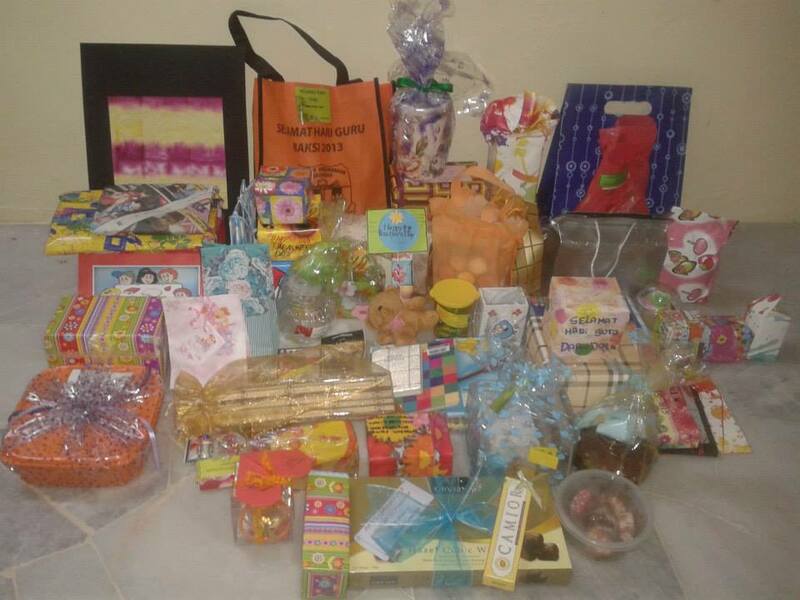 Slept for a while and dashed to Batang Kali to buy dinner and Teachers’ Day present at S&J Choice Souvenirs Shop. Slept after that for Night Class and boy, I felt nauseous and lethargic. I forced myself to teach but I could only manage to weather the setback for a bout one hour and 15 minutes!! 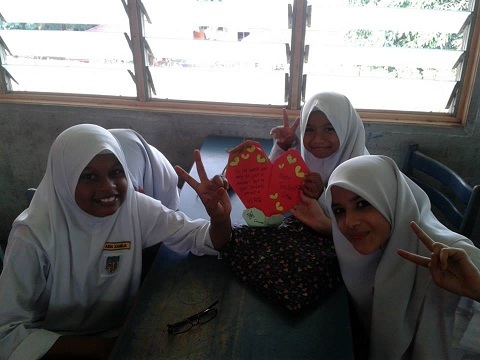 I had to ask Kak Fidah to replace me; thanks to her and the pupils for being understanding. 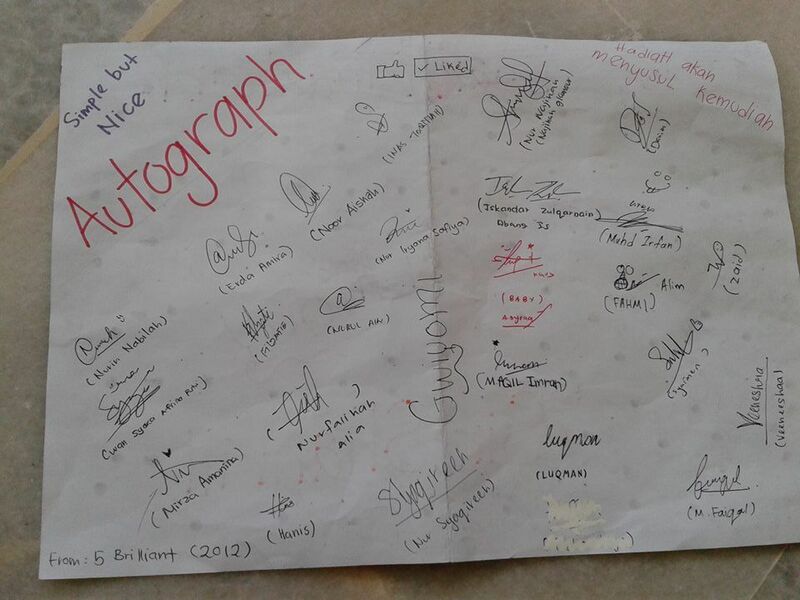 TQ so much! 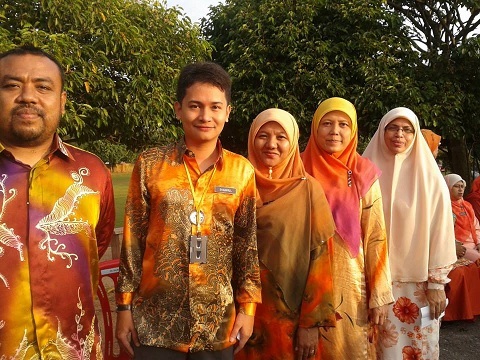 Cikgu Fauzi, me, Kak Nab, Kak Ruhaizah & Kak Bie. Tunas Pandu Puteri – “Rasa Sayang” extravaganza ala Citrawarna style. 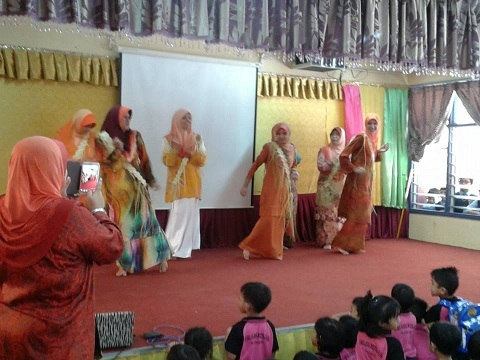 “Pahang Dance” by The Scouts. 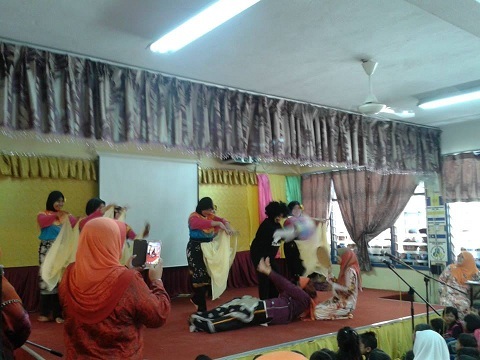 “Desa Tercinta” miming by TKRS. 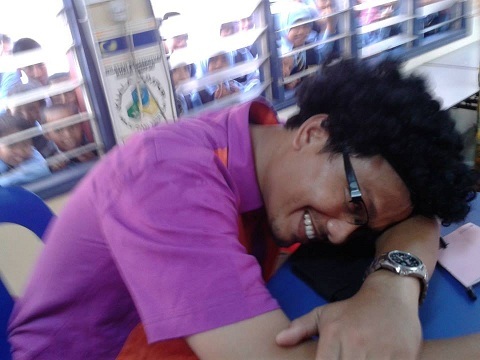 Fridaus as the sleepy Cikgu Shaari. The only picture I took on the stage as naughty boy. I hope there are other pictures as we got No.1! Supposedly, the “Pentadbiran” group was slated to perform; but prove to no avail. So by hook or by crook, The Red Crescent Society had to take the place. We just did our “thang” – first; the “Kwek Mambo” overture; and then “Pendekar Bujang Lapok” scene; “Masam-Masam Manis” scene; and the Islamic Gwiyomi as the finale. Hahhaha… initially we were NERVOUS but then everything was natural up on stage! We improvised here and there and YEAH, we finally did the Gwiyomi! Hahhahaa, I am not into Korean pop culture but since kids these days ARE SO INTO Korea, I just went with the flow…. (,”)! 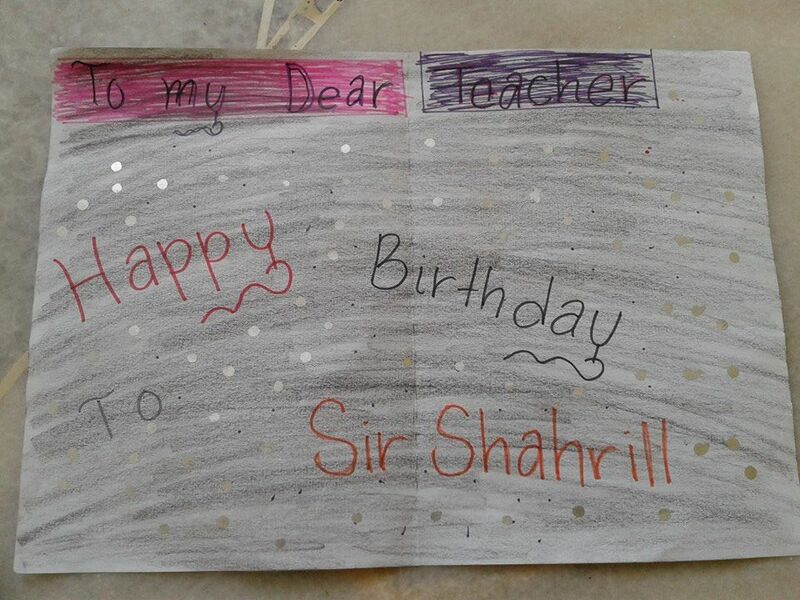 The pupils did the cards. 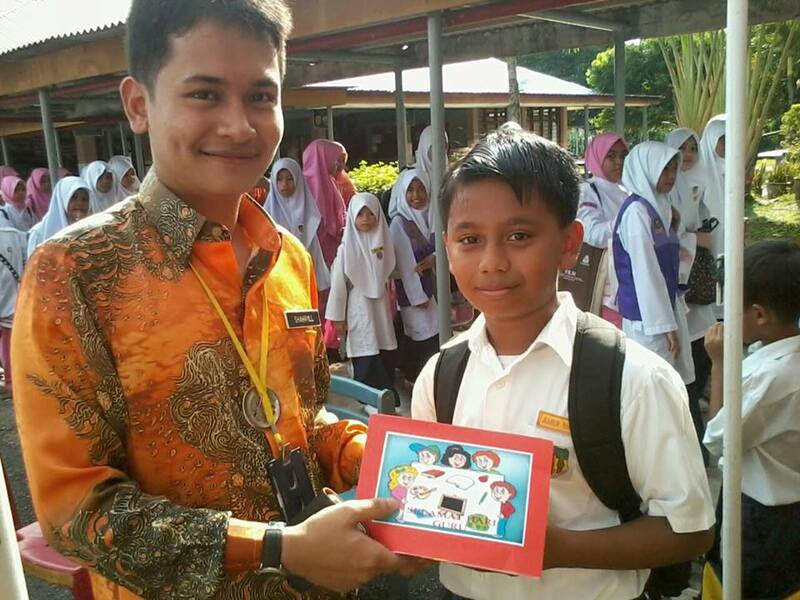 They even made the “pantun” on their own, depicting my style of teaching (stern) in the rhymes! LOL! Everything paid off when we basked No.1! Yeah, the Red Crescent Society teachers finally nailed that. 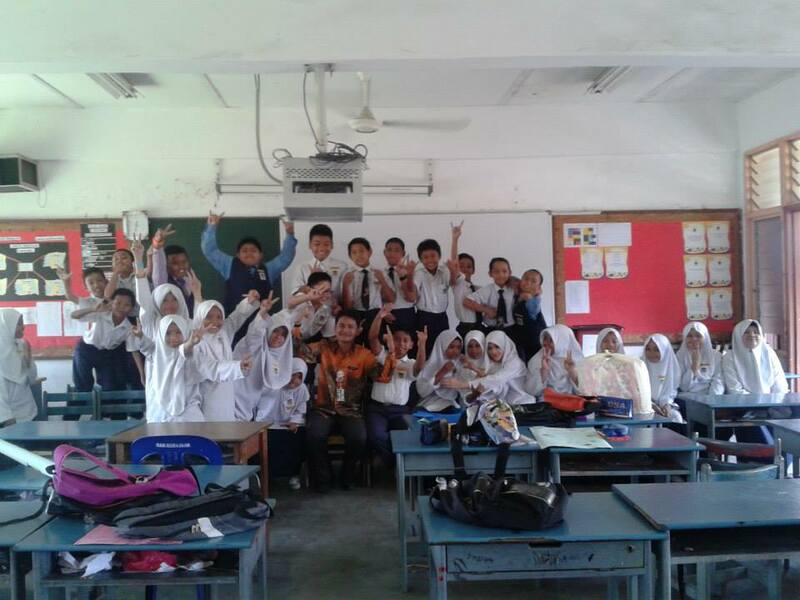 Congratulations to Fridaus, Kak Ayu, Kak Sharifah, Kak Huda, Kak Bie, Kak Hajah Rozita & I for that! On whole, I enjoyed myself in the Teachers’ Day. And I would like to extend my deepest appreciation to all pupils who remembered me in terms of giving me gifts or even wishing me. I treasure everything you guys gave. 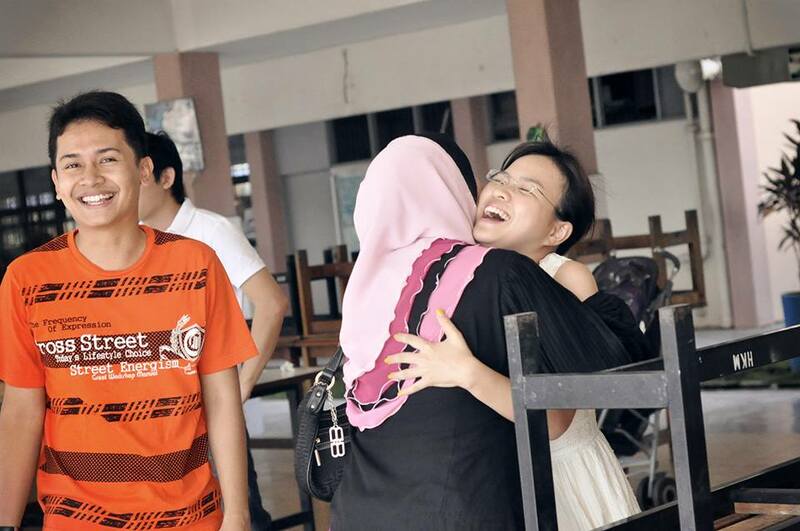 My eyes watered (and Kak Sakinah teased me!) when pupils gave me gifts – as a teacher, I admit that my words are sometimes harsh because I am a Discipline Teacher; but they saw through that. I am grateful. Thanks kids! 5 Dynamic for the Year 2013. And to my 5 Dynamic 2013, thanks for being a great school family-unit! I love y’all. I end this entry with a song mimed by the pupils of level 1 in my school. The beautiful lyrics make our eyes water as a teacher. 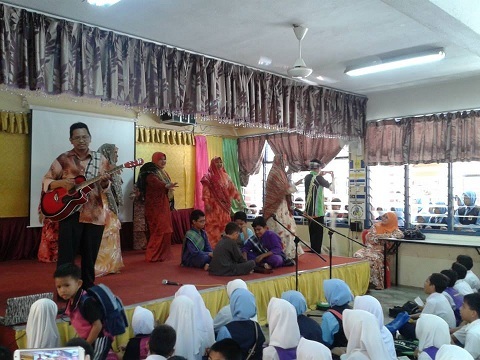 We really feel it as if the emotions depicted in the song was sung by the pupils. Awwwh… Thanks kids! My monitor & I, Amer Shazwan. A boisterous and playful but a responsible and reliable monitor. Thanks Amer! (Inalillah!) 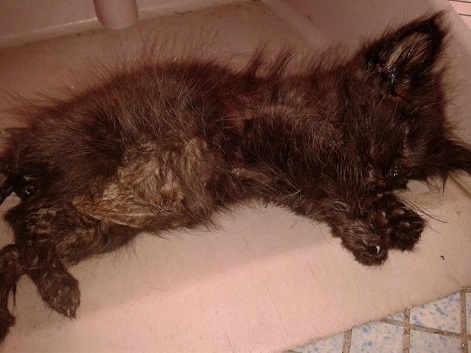 Waiting To Exhale: The Death Of Sooty, The Stray Black Cat. Stupefied & mortified. That was my reaction when I see the crafts of Angel Of Death lies upon my very eyes. The very last minutes; the gasping for the Last Breath. It was indescribable. The truth is, I’ve always wanted to have a pet cat since I was young but Mak won’t let me because my sister and I were prone to cold and influenza-ish symptoms; the cat fur is very tantalizing on that department. It was until last 4 days that the urge reemerged. I saw a timid and very scrawny little kitten feline at the backyard of my house! It was groaning fiercely towards another bigger male cat who is a regular ‘visitor’ to my house (this male cat is very fond of me and like to be stroked; very friendly cat!). I just paid no heed; until at night I saw the little kitten was taking refuge at a dry small drain (which happens to circulate my house) from the coldness of nighttime. I was touched. I never take care of a cat before; hence I didn’t know what to do. So, I just brought in the cat and placed it in the store. I tried to give it dried fish (I didn’t know it didn’t favour that!) but it won’t eat. So, I just left it in the store so that it would be warm. On Saturday, so happened that I had cancelled my social calendar due to the other party was having professional commitment. So, after my Extra Classes at school; I pushed off to a pet store in Rawang and spontaneously got myself the cat milk powder as well as a cage tantamount to RM65; all in the name to raise the kitten back to health. It was spur-of-the-moment thing; and you know me – I am a spontaneous person. Islam preaches goodness and kindness towards animals. 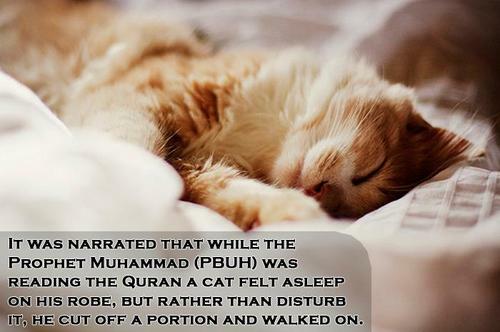 It was stated that Prophet Muhammad SAW had a cat named Muezza. You can check : http://en.wikipedia.org/wiki/Muezza. With milk, the kitten seemed a little bit stronger. It could stretch the body and stood up although the hind legs were weak. On whole, the body was scaled ala sclerosis and one of the eyes were a bit “watery” – it could be konjunktivitis? 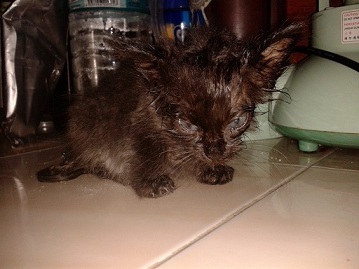 ; and it had strong BAD SMELL no matter how hard I tried to bath and put a little bit of ‘fragrant smell’ to it! BUT, I was a bit worried because it didn’t consume anything except for the milk that I force-fed. Could it be that I had missed something? 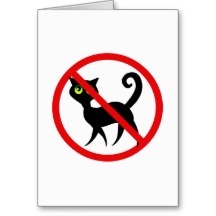 I tried to find information on Google or consult a few FB friends who I deem very knowledgeable about cats; but in the end, I thought it was better if I were to consult the veterinarians myself! 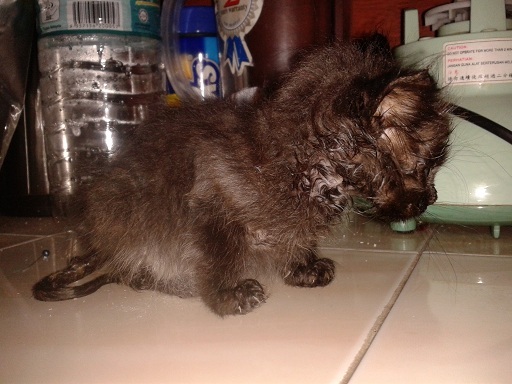 Therefore today, I bought the little “Sooty” (the unofficial name I coin for it; adapted from Enid Blyton’s “Mr.Pink Whistle” ‘s black cat’s name) to Klinik Veterinari & Surgeri PC in Jalan Hijau, Rawang. 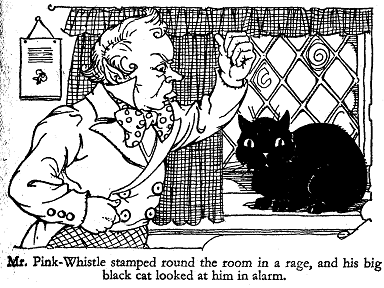 I showed Sooty to the Vet and his first exclamation was that the kitten is a worst-case scenario. I didn’t understand the terminology he said but I thought it sounded as if “problem of pungent or “pungentry” (which doesn’t exist, by the way! )” but I got the gist of his advice. 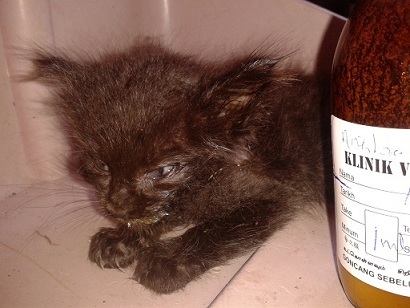 He said NO MILK should be given because the kitten was having trouble with his digestion/defecation system (that explained the BAD SMELL) as milk would only encouraged that. He said there was this cat food which was good but since it contained pork; of course I won’t be thinking about that. Since I was adamant to try to safe Sooty, they prescribed liquidified antibiotics and some fever pills to be crushed although I’ve been warned that it would be fat chance. The Vet said tried that for a week. The attendant was nice (I don’t know whether she is a Punjab or a Czechoslovakian as the English accent is very much Eastern European-ish. She was enthralled to learn that I am a teacher in Serendah given my ‘young look’ (another typical assumption); I was having hard time to understand her instructions but I’ve got the fact right. After consuming the antibiotics; around 3.30 p.m today. Looking a bit peaky. So, I took Sooty home (today is a very scorching HOT day with 35 Celsius!) and fed it with the medicine. Then, I pushed off to Batang Kali to buy my dinner and all. Around 1 hour and half later when I came back home, I saw Sooty was lying very weak in the cage. Oh, no! I became worried. So I took it out and try to make it stand. But the hind legs won’t erect and the head started to loll! The eyes were becoming sullen and the breath gasping was vigorous. My heart started pumping; I DREAD it would happen…! But, Inalillah; everything goes back to ALLAH SWT. With one last breath (like in drama), the head and the body stopped moving. No more inhaling breath. Sooty was gone. I was STUPEFIED; I didn’t know what to react. It was for like 5 minutes after that; that I was bawling crying. 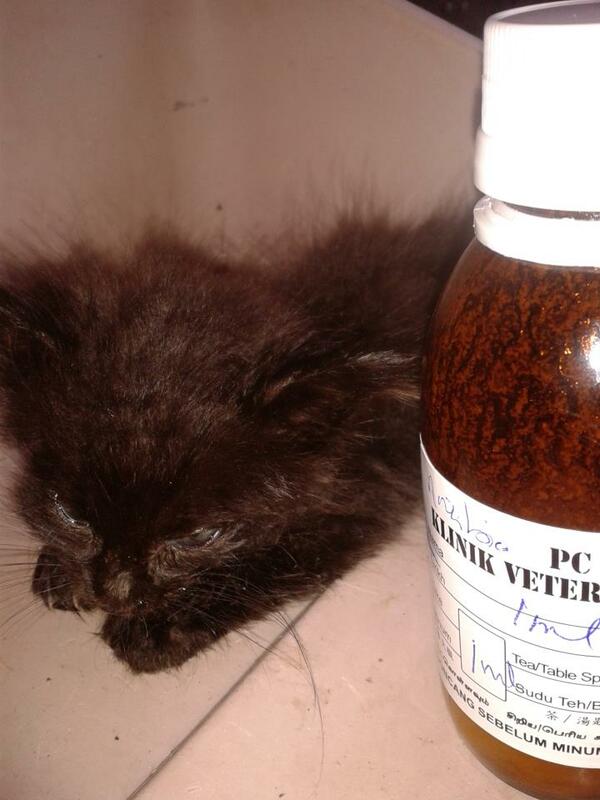 I felt sad because I thought I could make a difference; trying to nurse Sooty back to health. 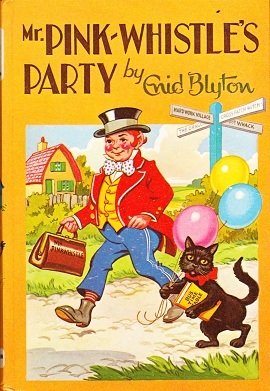 AND I was feeling consciously guilty – could Sooty died BECAUSE the weak body was shocked to receive dosage of antibodies??? Was it because of me??? I don’t know; and will never know. Inalillah. Everything goes back to ALLAH SWT. It was irony seeing the tall grass at the backyard of where I used to put Sooty to ‘explore’; now stands above Sooty, the corpse that lied 6 feet under….. Yes, the Vet already warned me that Sooty is already a considerable “gone-case” but I felt like it was bad to neglect it. In a way, in this sadness, I feel shades of happiness that at least I helped this weak creature when it really needed me. 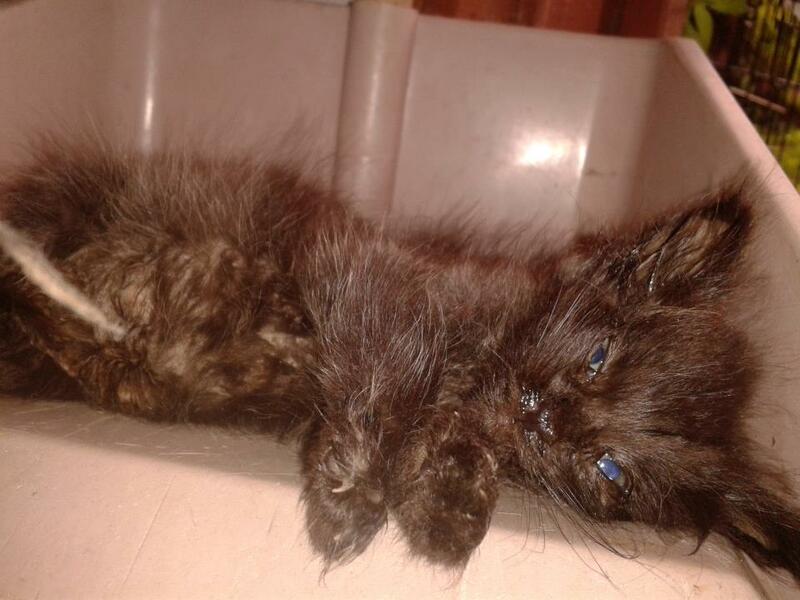 Despite its falling fur, the UNBEARABLE bad smell and condition of the eyes, I manage to take care of Sooty. I hope ALLAH SWT will bless its soul. 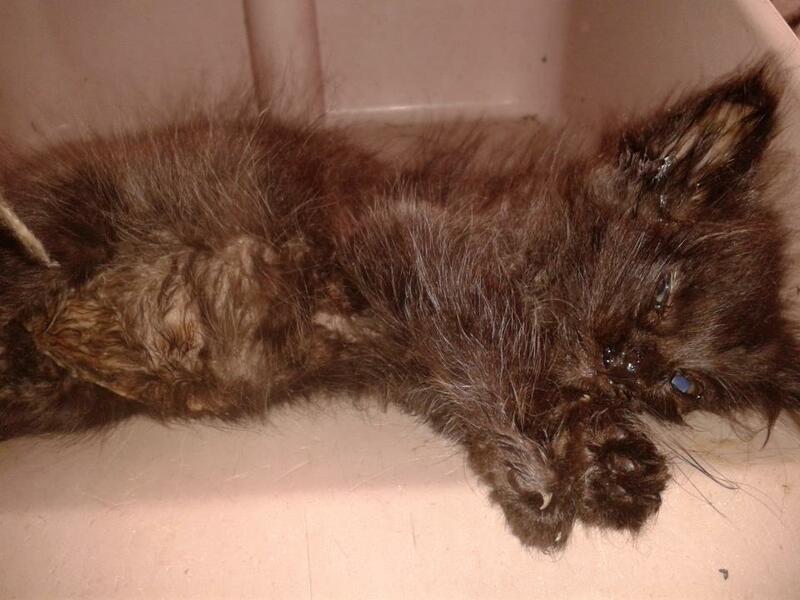 I hope Sooty will know that I did the best to safe her. May you help me back in the AfterLife, Sooty. Inalillah…….. 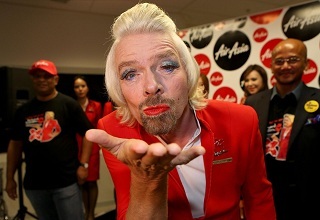 The Fiery X-Rated Affair : Sir Richard Branson Paying The Air Asia X Stewardess Debt! You all know I am Air Asia fan. Yeah, economical budget airline system! So far, all of my abroad trips were all under the wings of Air Asia regardless the compressed seating and the “if-you-want-more-pay-more” policies. Anyway, that is not why I am writing this piece of article. Even shaved the legs! LOL! Approximately 3 years ago in 2010 at Abu Dhabi Formula One, both Sir Richard Branson and our Tony Fernandes (who used to work with Branson) sealed a bet, vying for their teams to finish the line first. 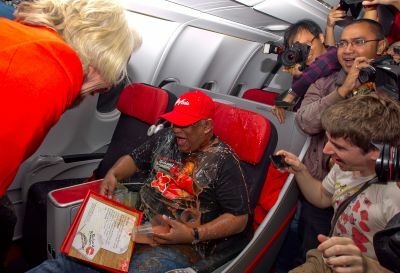 Both of them agreed that anyone lost would have to serve drinks in their respective airline for a day – Richard Branson with his Virgin Airlines & Tony Fernandes with his Air Asia X. Richard Branson was so damn sure that he was going to win the bet; but boy, that went wrong! Hahahhaa! Finally, the ANTICIPATED time to pay the debt was here (I was freaking dying waiting for this day; from the day I heard about the bet 3 years ago!). The flight from Perth to Kuala Lumpur witnessed the historical event. Oh, well… he did look cute with his legs shaved and the sleek up-bun hair. Hahhahaa! 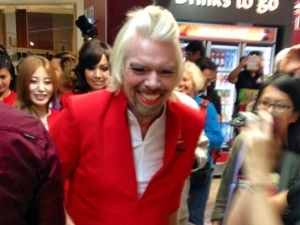 It was reported that Richard Branson even spilled drinks while he was serving Tony Fernandes! Hhahahaa, but all of this are for good cause. A potion from the sum of money of the event will be channeled to Starlight Foundation for children’s charity. Oh, no! Spilled the drinks??? 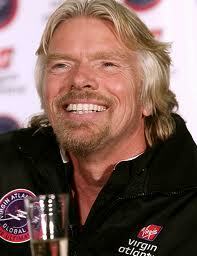 Richard Branson… you are fired! LOL! 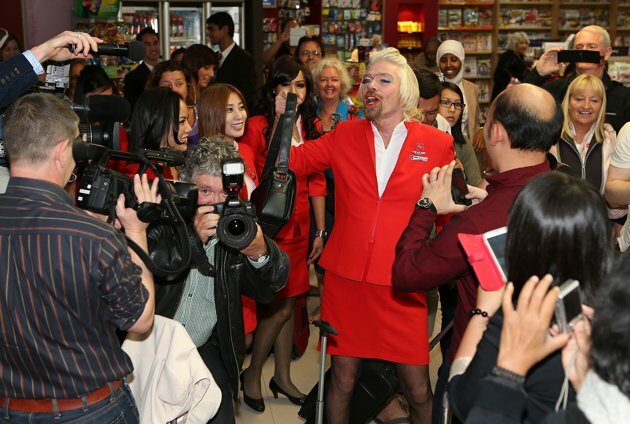 Whatever it is, I think this is another good publicity to boost Air Asia X, aite? 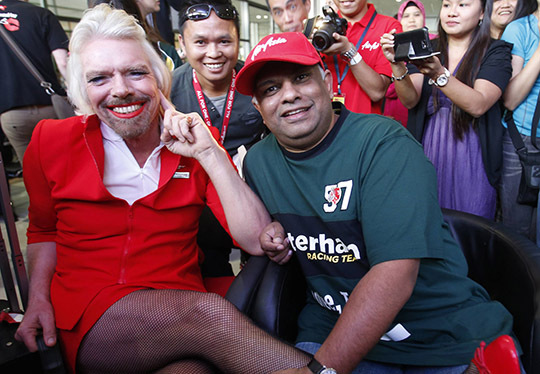 Not to forget Tony Fernandes as well as Richard Branson himself! To THIS! Hhahahaa….. Well, no way out! But yes, he is cool. Another publicity to boost his name; from his Necker Island fiasco.